respect to Destr & AAA!! Thanks Destr ! The Best Coder Of People !!! I like the intro and outro, the main part is a bit goofy. this prod killing zx scene!!! Fackowost budet narashivat swoi oboroty my i tak dolgoe wrema byli w teni, pora nashinat bit klona w serce ! Worst side of the oldschool - compilation of ripped and converted graphics, old music, mediocre code, and no idea behind, which could justify it. 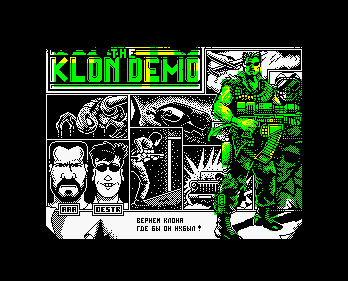 Don't know why but still like those AAAband speccy demos with their oldschool gfx/anims and nice musics. page created in 0.014366 seconds with 15 queries.